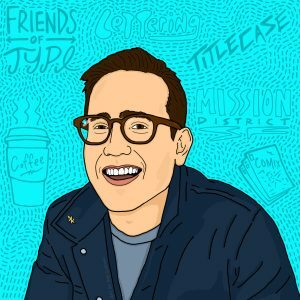 During this year’s San Francisco Design Week, I sat down with Erik Marinovich of Friends of Type and Title Case in front of a packed house at Butchershop Creative to talk all about the lettering artist’s journey and the new trails he’s blazing in the world of design. The evening was recorded live for my podcast, Making Ways, all about the unexpected paths to a creative career. Our conversation was far-reaching. Erik gave everyone a closer look at his process for lettering, his perspective on staying engaged creatively, and the community relationships that fuel his life—not only as an artist but as a citizen of San Francisco and the larger global community. Since our interview was part of San Francisco Design Week, here are a few takeaways aimed squarely at illustrators, designers, and all other creatively driven minds. Read on for Erik’s inspiring perspective. Besides the challenges he sets for himself so he doesn’t fall back into old creative habits, Erik also lets time gang up on him. However, there’s a method to the ax-wielding, deadline-looming madness. Erik said, “I put ideas on paper and walk away, letting them just kind of marinate in my mind and not really putting myself in a position where I’m over-pressuring myself. . . .I give myself the last day to really fine-tune. . .the final artwork that I’m handing to the client.” Erik has hit on a strategy that works for him, although he did note that one byproduct of the process is an “excruciating time crunch” right at the end. Of course, there are ways that Erik could go about easing some of this creative and scheduling tension, but that would go against the point of his whole pursuit. That’s just a glimpse into our conversation for Making Ways during San Francisco Design Week. You can listen to the entire episode here and subscribe to the series on iTunes here. Thanks to Erik for joining in and being so open in sharing his experiences and insights. And thanks to everyone who made it out for our first live taping at Butchershop Creative. You can find the adventures of Erik and Friends of Type on Instagram, and get the latest on Making Ways podcast there too. Be sure to connect and let us know what you thought of this episode. This article first appeared on AIGA’s website. Find the link here.